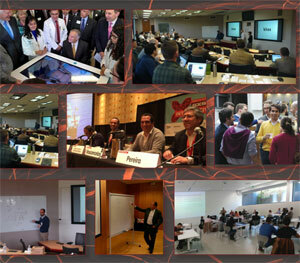 The UT Austin|Portugal Program has released two comprehensive reports covering its activities for the period 2013-2015. The UT Austin|Portugal Program has released two comprehensive reports covering its activities for the period 2013-2015, one for the University Technology Enterprise Network (UTEN) program and one for the CoLab academic programs. On September 14, Veterans Affairs Secretary Robert McDonald, Senator John Cornyn, Representative Rubén Hinojosa, and Texas Governor Greg Abbot got first-hand experience with Body Interact, the medical education simulator from Global Startup Program partner Take the Wind. The officials were on a tour of the UT Rio Grande Valley Smart Hospital, a state-of-the-art facility which simulates all departments of a working hospital to train health care providers and first responders. Body Interact is a unique interactive medical education platform which runs on multitouch table-top and tablet devices as well as by web conference. Body Interact’s flexibility allows it to deliver detailed and customizable medical scenarios in a full range of individual and group educational settings. For the past year, business development specialists from the IC² Institute have been working with Take the Wind to hone its message and develop relationships with medical educators and potential customers in the U.S. and worldwide. On May 19, Global Startup Program alumnus Feedzai raised $17.5 million in Series B financing. Feedzai provides fraud prevention services to financial institutions, retailers, and developers. Using “big data science” and machine learning, Feedzai generates transaction risk scores which adapt to consumer behavior in real time.